Broccoli Scacciata: to Middletown with love! Wait a minute. If you didn’t grow up in Middletown, Connecticut, you may not even know what I’m talking about. I never realized the double-crusted, stuffed pizza-like creation I grew up with was unique to my town. You see, my hometown is the sister city of Melilli, Sicily. While others might not be familiar with scacciata, we natives took it on faith it would always be available here. Growing up, that meant a trip downtown to Marino’s Bakery on Ferry Street in the North End. And, as years went by, it also meant D&S over in the plaza off of South Main Street, where Taino Smokehouse is now. If memory serves, we lost Marino’s sometime in the 90s. Then about 10 years ago, when I moved to the D&S side of town, D&S closed, too. Are you kidding? Where would we get the scacciata now? It served so many delicious purposes. Night before a holiday? Just plain hungry for something good? Gotta get scacciata. Broccoli was always a favorite; spinach a close second. Of course, there’s potato, too. You could even combine the three, depending where you went. And, if you had Sicilian grandparents or parents, they likely made their own variation right at home. For the longest time, I’ve wanted to learn to make scacciata. I had even found an adopted nonna to teach me–our friend Mary Ann’s mom, Cora. But sadly, it never came to be. Until now! Let’s break it down in three steps. In the bowl of your stand mixer, dissolve the brown sugar in the warm water. While the water is still warm, add the yeast. Wait about 15 minutes to see the yeast start to activate. Using the dough hook, add the olive oil and remaining dry ingredients and slowly start to mix. After the dry ingredients are wet, raise the speed and mix until a nice, smooth ball forms, about 15 -20 minutes with a Kitchen Aid mixer. Keeping the speed just below medium should prevent your mixer from taking a little walk across the counter! Now you should have a dough ball–coat it with olive oil, place in a large enough bowl to allow the dough to rise and refrigerate at least three hours. Overnight is better, or you can even let it age for a few days. I made my dough Friday night for scacciata on Sunday. 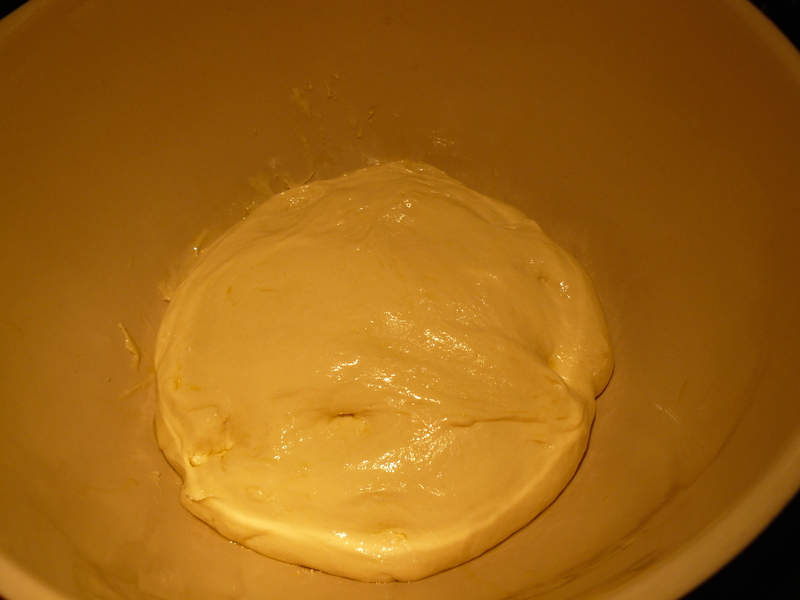 The dough looked like this when I took it off the hook on Friday. I almost thought I had kinda gone overboard with the size of the bowl I chose. But look how it grew overnight! Second, the broccoli and sausage filling. First, coat the bottom of a large saute pan with olive oil, then saute the shredded sweet onion over medium heat. By the time 15 minutes have passed, the onions should begin to brown a bit and stick to the bottom of the pan a little. No worries, just add the hot sausage and it will all come together. This is a good time to turn on the broccoli, but more about that in a bit. Break the sausage into small pieces as you go. Just when the sausage is cooked about all the way through, set a timer for one minute, throw in the pressed garlic, stir, then remove from heat. 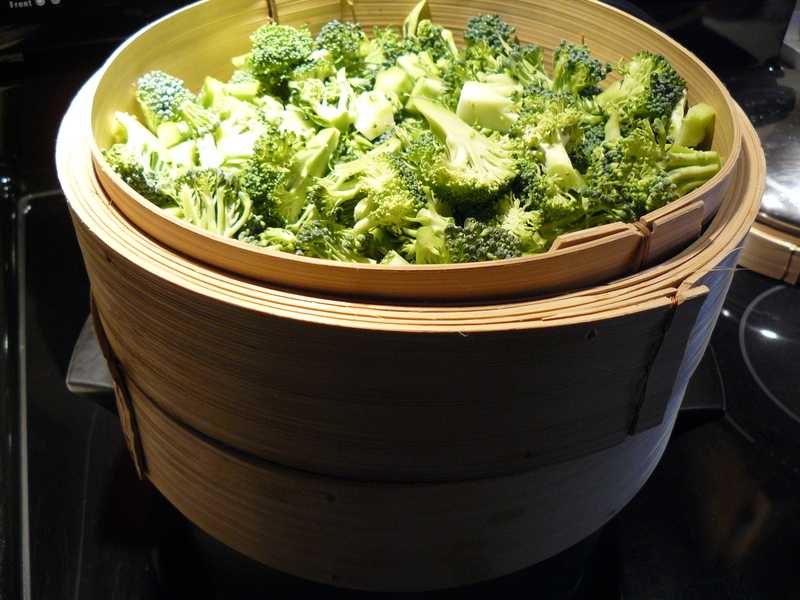 I used my double-decker bamboo steamer baskets to steam the broccoli. Once the water begins to boil, let the broccoli steam about 5-7 minutes. It should be bright green and fork-tender when it’s done. 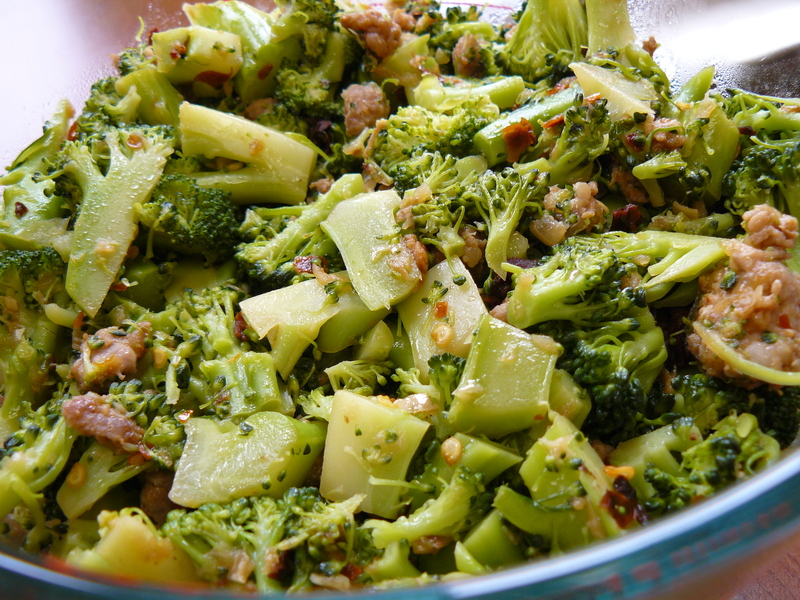 Stir broccoli into sausage/onion/garlic mixture, add a teaspoon of crushed red pepper, sun-dried tomatoes and salt. You just made 8 cups of filling! Holy smokes! Cover and store in the fridge till you’re ready to make your scacciata. We’re almost there, amici! Third, let’s put it all together! Ready? If you have a pizza stone–and, yes, you want one if you don’t have one already–set it on the lowest rack of your oven and let your oven preheat to 425 degrees F for one hour. Let your dough come up to room temperature as the oven preheats. Don’t forget the cheese, please! Oil a large rectangular baking sheet. I can’t promise you anything scientific here. 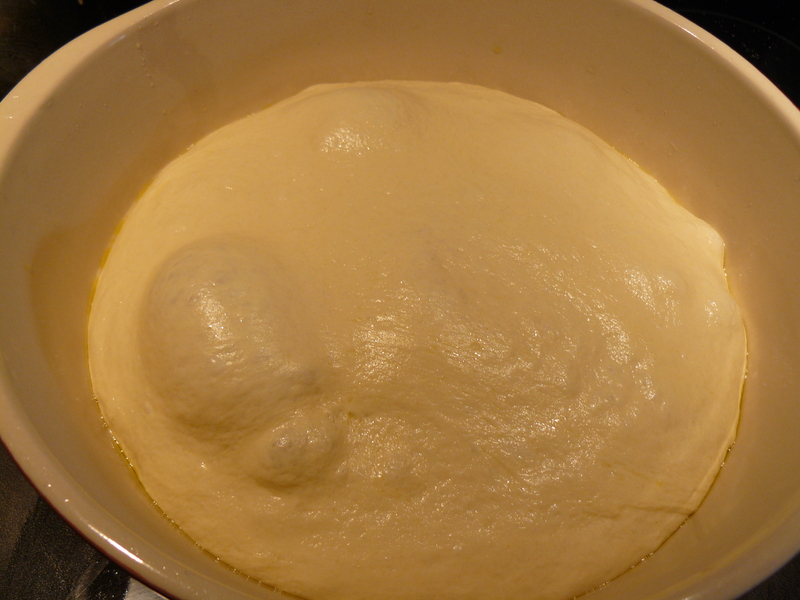 Divide the dough in the bowl into two halves. 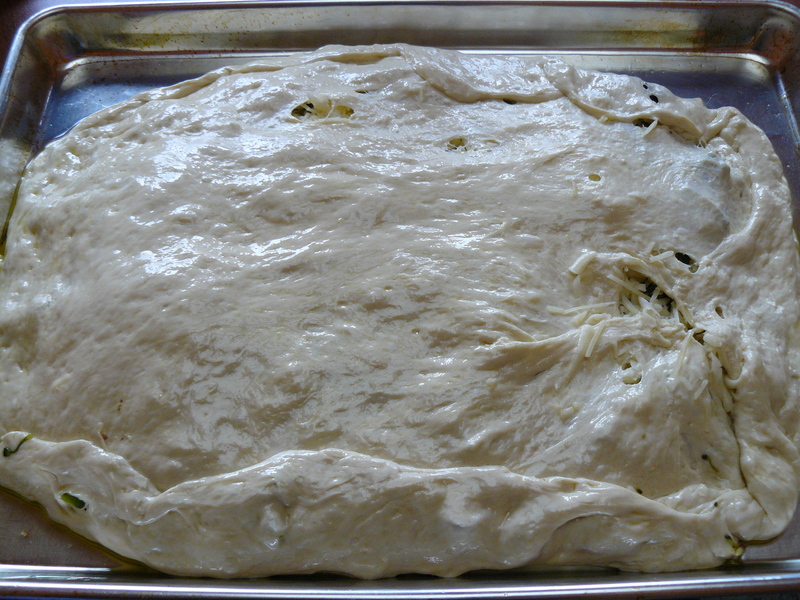 Put one half of the dough on the sheet and begin to flatten it and stretch it as best you can. Flatten and stretch and move and shape and hope for the best. You’re trying to make a rectangle, but guess what? If it’s sort of oblong and rounded, who cares? You just want a flat, even base shape on which to mound all the tasty toppings you made. 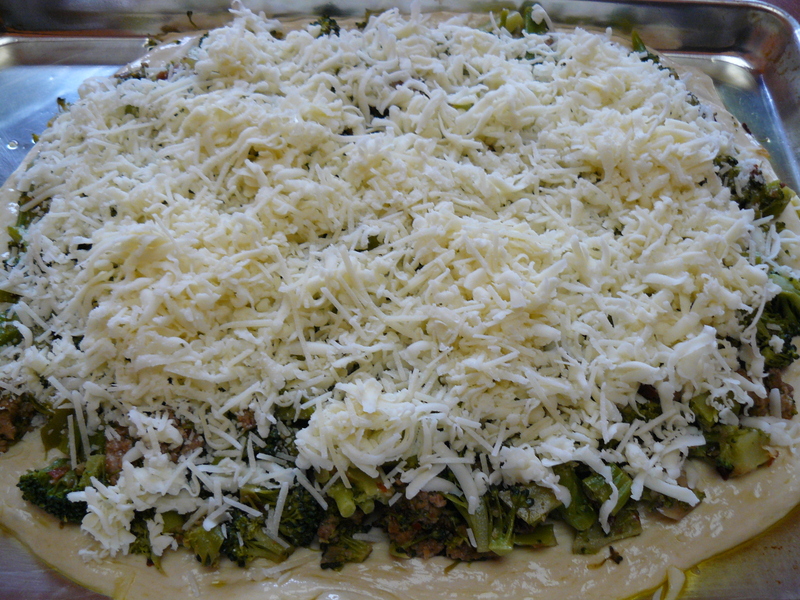 Having the broccoli topping to press down into the dough actually helps spread the dough out a bit. You’ll see. Next, we add the cheese. Looking good, right? Now the part that stressed me most. How to stretch out the other half of the dough in roughly the same shape, then move it to cover what you see above? AYEEEE! Grab another rectangular pan and coat it with olive oil. Repeat as above: stretch and move and hope and pray and do your best to flatten into a piece of dough you can lift and stretch to form the top half of the scacciata. You can do it! WHEW! We got it! Fold up the bottom layer over the top to seal the filling in. See there are a couple of holes on the top? No problem at all. Now, place your baking sheet directly on top of the pizza stone and bake at 425 degrees F for 25 minutes. Let your masterpiece rest 5 or 10 minutes once you take it out of the oven. Use a pizza cutter or sharp knife to cut. Look how nice the bottom crust is, too! I’m the happiest girl in M’town now that I can make my own scacciata. In fact, I’m so happy, I could go dance on the railroad bridge as Billy Joel did in this song featuring my hometown. Except it’s dark. And cold. Maybe another day. I can only tell you I made one of my own dreams come true today, and that’s enough for this kat. As for you? You’ve gotta make this scacciata! Subito! Subito! Aww, thank her! You know, smarter me wondered about that after the fact! I might need a larger pan to do the fold-in-two part. In other words, I think one crust may take up more than half the pan, but that is definitely a better idea. 😀 Happy spring to you both! Wish I could find scacciata here in Ft. Lauderdale. It has been years since I’ve had some. That was a great challenge from Andrea. This looks great and I will be trying this to bring back old memories. Now for challenge 2, the recipe for Marinos pizza with meat sauce. I would love to have that too. Thank you for posting this! I grew up in Middletown in the 1950’s and Friday night was Marino’s pizza night. (I never knew pizza could also be thin crusted!) On Special occasions we got the scaciatta I have been looking for it ever since. I think you just have to be from Middletown! It really is a Middletown thing, Suzanne–and it makes me so hometown proud! 😀 Thanks for stopping by. I’m a 40 something year old Sicilian (Melilli) who longs for the wonderful goodness of D&S Scaciatta. Gotta’s farm in Portland gets it regularly from an “authentic” source. I wish that “authentic” source would open her own place so I could get it regularly. I grew up on Liberty St and remember Theresa’s. The good old days. If anybody knows where I can find a pizza place even remotely resembling Marino’s please let me know. The old Aldos on Newfield Street came close with the meat pizza but they closed. Anywhere????? Really honestly? 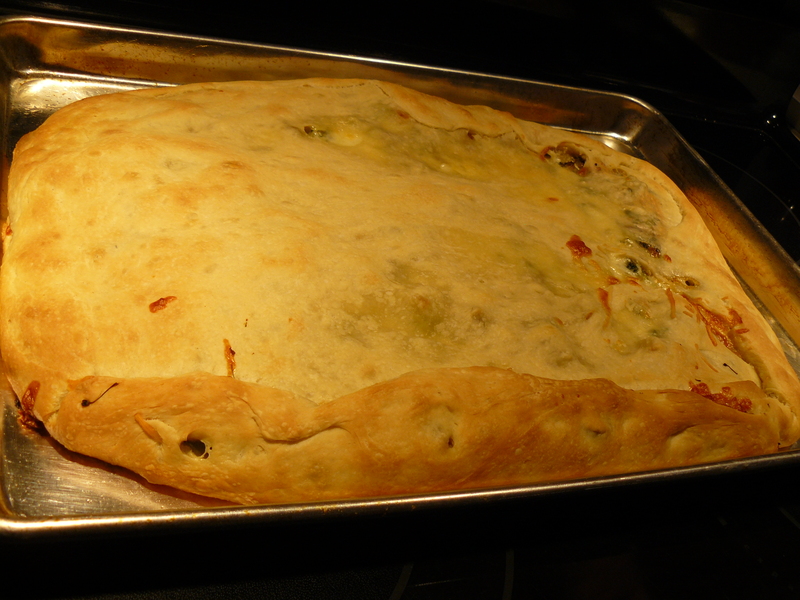 Make the dough in this recipe and make a giant sheet pizza. That’s the closest I can help you. No one makes pizza like that anymore that I know of except people like me who missed it and figured out how to make it at home. It sounds like you are talking about Al and Paul Maturo right? Al and I played basketball together at St. John’s. When I was in 7th and he in 8th we beat St. Sebastian’s 54-30 in the old Benefit Game and I remember having 16 points that night. I lied and said I lost my shirt when it was time to turn it in. (OMG a former altar boy lying!!! ), I kept my shirt from that game and it still hangs on my wall today. Think it meant anything??? Ahh the good old days. If you make pizza and it comes out anything like Marino’s (or even D&S) you’ll get a Christmas card from me every year for life lol. Al and I were both on Bus 3..Now you’ve gone and done it, I’m walking down Memory Lane right now. I always love walking there. 🙂 Good to meet you, Billy G. Al tells me you were a guard and a good outside shot. 😀 Small world, huh? A very small world indeed. Hey, the next time you talk to Cousin Al, say “hey,” give him a bear hug for me, and tell him that even thirty years later my outside shot has not deserted me even though I’m incapable of making a PB&J sandwich without consulting a cook book. Hey, I didn’t inherit yours and his culinary genes so sue me!!! MacDonough School I remember it well, for years we walked there from school for gym class because we didn’t have any facilities of our own, I mean My God, I think St. John’s was built when Peter the Apostle himself was a 7th grade altar boy/ starting forward on the basketball team. If you went to Mac-D, you must have grown up in the North End; what street did you live on then?? My aunt lived on High Street for fifty years and I spent every Sunday of my childhood, unless it was Christmas or Easter, at her house for spaghetti, meatballs, sausage, and Italian bread from Public Market. And I mean EVERY Sunday.. I like bantering with you; you bring back the vibrant images and memories of former days. How did it come to all this, wasn’t I trying to find out about Marino’s Pizza LOL??? I grew up in Middletown and Absolutely Miss going to all of the Wonderful Italian restaurants & Markets. My parents came from Sicily & Mellili in the early 60’s . She still lives and breathes Italian Heritage and Cusine. Sciacciata is my absolute Favorite!! Especially the potato and Ssussge. Thanks for the Recipe. Love it!! Thanks for stopping by, Sheila! Scacciata definitely makes our hometown special. thanks for the article, The broccoli,spinach, potato one from D&S pizza was my favorite. Any relation to Tony LaBella, the school principal? A wonderful man. I adored Mr. LaBella, “the swell fella!” He was my principal at Macdonough School when I was a kiddo. Sorry you had some trouble replying. I loved and admired your brother Tony. He was an awesome principal. I fondly remember his special awards with a picture of Snoopy on his doghouse. He even kept up with what I was doing and encouraged my writing efforts after I graduated from college. I’m still in Middletown. Would love to talk to you sometime. Your brother was a special guy. I thought the whole world of him. Katy I just sent another reply,and I fouled it up again.I do not know your last name or do you have a married name?Please bare with me for a few emails,as I am still trying to figure this PC out.I am going to sit here to wait for a reply. I was trying to explain this to the guys at work today. i grew up in cromwell and my dad would bring these home once in a while. this was in the 70s. im 51 now. imagine my suprise when, after i googled it, i find this article. im making it tomorrow though i dont remember broccoli. i remember spinach and potatoes.thanks a million! How fun–nice to meet you, Steve. Definitely check back and let us know how you make out! also i just talked to my sister and she says it may have come from giovannis??? I LOVED Giovanni’s pizza growing up. I never remember them making scacciata, though. But they might have! Hey, nice to hear all the compliments about Marino’s. That was my family’s restaurant on Ferry St! Patty Cakes on Rt.3 in Rocky Hill, across from Century Hills, makes a Marino’s style pizza. However, I make my own Hamburg topping, as they do not! Katty remember me? The St. Johnie and Stones fan your cousin Al said had a mean outside shot (he speaks the truth lol.) Sorry we lost touch..my bad indeed. And to Barbara Marino..I can state with no ambiguity whatsoever..Marino’s pizza was God’s proof that He loves us and wants us to be happy. Where can i find something close? Hey there, Bill–I do remember. You know, people say Patty Cakes, but I have yet to find a pizza like that OUT as well as I like my own. Do report back if you think Patty Cakes comes close, tho’! No disrespect to Patty Cakes because their pizza is pretty damn good but it does not come CLOSE to Marino’s. The crust was definitely ‘crunchier’ at Marino’s and whenever I got there before the pizza was ready, I remember standing there in the kitchen and watching those sweet old ladies pour like three different bottles of this or that over the pizza before wrapping them in that brown paper bag covering. As for the sauce..saints be praised. Their recipe for hamburg pizza should be put in a time capsule to prove to future generations we were indeed civilized lol. Ahh Marino’s another wistful stop on Memory Lane. I used to go to Sal’s on Pearl St. Millie made a great pie with broccoli. potato, sausage and cheese..the seasoning is what made it taste good..I wish I knew what it was. 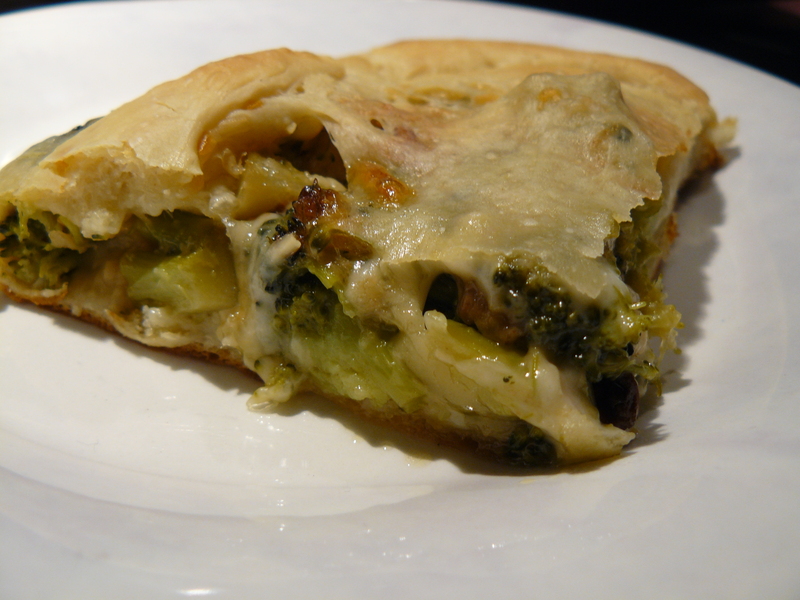 You can’t find it anywhere except for Newfield St and that’s just broccoli pie. Hey there, thanks for stopping by, Maurice. I have to ask my family about Sal’s. What year was this–do you recall, roughly? 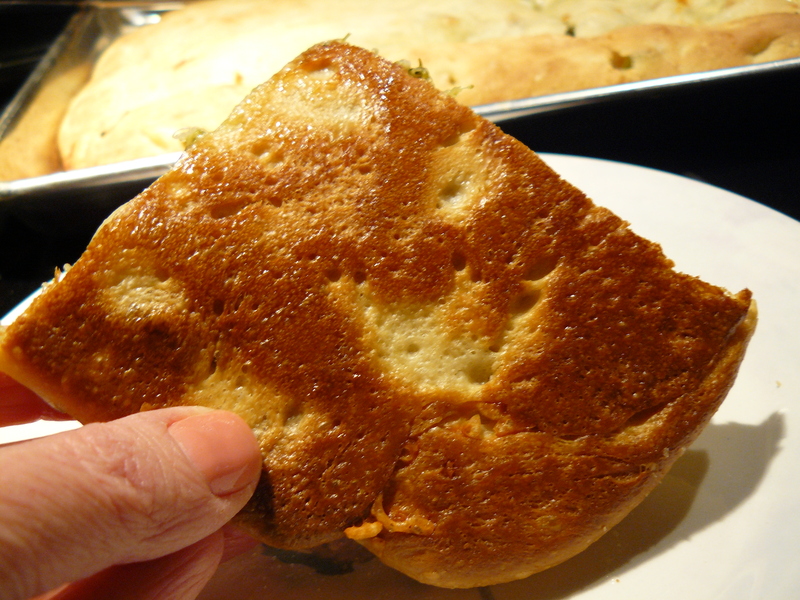 You’ll be happy to know that the Portland make scacciata…I loved it , but then, I never had it before. I’mm going to try to make your version tonight, scaled down for 3. This is so weird. Sitting here craving D&S potato scaccata. Do a google search for recipes and find out I grew up in the only town in this country that really knows what it is. Mind blown. No wonder people are confused when I talk about it. You learn something new everyday. Thanks!! Both my dad and my Sicilian FIL grew up Middletown, and I remember Marinos well, as a kid. We got either the hamburger or anchovy pizza. Nothing else like it. If anyone can share a recipe, please do. I think my dad went to St John’s, and I was married in ’95 at St Sebastians. I had no idea scaciatta was so very regional – I may try to make it for FIL. Thanks for the memories! I didn’t realize it, either, till I got a little older and no one outside of Middletown knew what the heck I was talking about. 🙂 Thankfully, we know what’s great, don’t we? 🙂 Hope you enjoy! Hey there, on a whim, searched for “Marino’s scaccatata” and found a few people still talking about my family’s food and restaurant in Middletown. I can’t tell you how much pride this instills in me. Glad to know the love and hard work my family put into the place still resonates. What a treat to hear from you, Barbara! Whoever feels like giving it another run, the people of M’town would welcome you with open arms and open wallets! 🙂 Thanks to your family for many happy back-in-the-day memories. Barbara, your family’s restaurant was truly an icon – my own family and my husband’s have such fond memories of the atmosphere, people, and food. I’m a huge fan of Frank Pepe’s in New Haven, but have yet to find another “Marinos” with that Sicilian style pizza. My best to you and your family! I googled scacciatta and this post came up!! I grew up in Middletown and moved to RI 30 years ago. No one here knows what scacciatta is! I miss it so much. I have heard that Gotta’s Apple Store in Portland – believe it or not – sells a pretty good one. I have yet to come home and try it. My family had many meals from Marino’s – it is sorely missed. Just saw your recipe for Scacciata, looks great. I’m from Middletown too, graduated Mercy and attended Middlesex. I moved to the Keys and no one knows what Scacciata is down here. Marino’s had the best, Illiano’s has a version they call stuffed pizza it’s not bad. Thanks for posting. My grandmother also made it with chicken…….not a fan!!!!! The website messed up my last name, I think I corrected it. I grew up on Pearl St. Two houses over from the church. This really is a blast from the past! Mercy Class of ’81 here! My mom was Northern Italian so she never made scacciata but one of our neighbors made it for us all the time. It really is the best! I have yet to try Katty’s broccolli Scacciata recipe but it looks good! My favorite was the good old potato and onion. Any ideas for a recipe for it? Hi, Karen! You know, I never tried to make the potato one. Am guessing you could cook a similar amount of potatoes to sub for the broccoli. Might be nice to roast the potatoes in the oven to cook with a sliced sweet onion, even. Though not now with the weather being as hot as it is!!! I googled and found this as well. If you do make the potato version, would love to hear how you make out! That recipe looks great! I will definitely try it and let you know! That’s a great article. My aunt’s had a lot of great recipes that came from Italy and the necessities of the Depression. Middletown is a uniquely Italian town – I miss it! Another favorite is the beef cutlet grinders at the Portland Restaurant. I still get them and they are great but I remember for years the 2 Italian ladies who cooked them in that tiny kitchen! They were there for many years after I moved away. I would always stop in when I was home. They are not there any more but the grinders are still some of my favorites from home! I grew up in Middletown and am Sicilian descent. 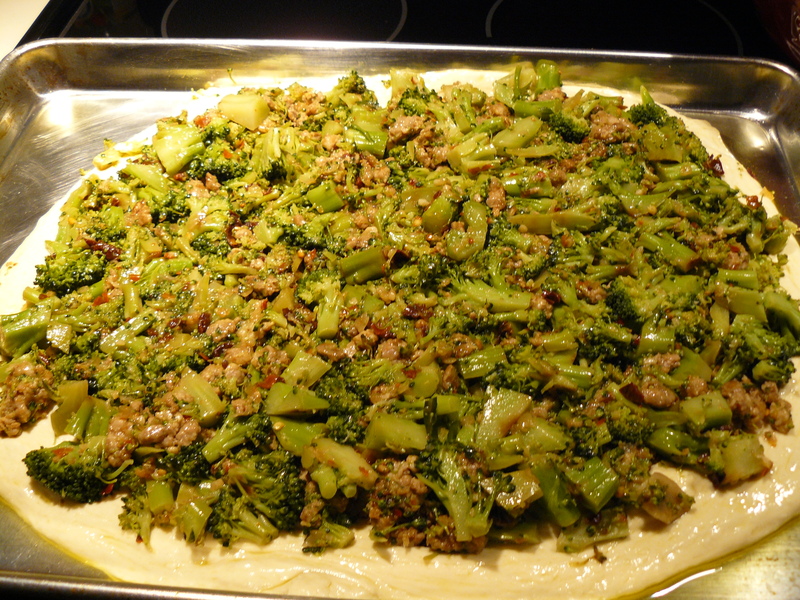 Every holiday we had scacciata at my aunt’s house….broccoli and sausage. Potato and sausage or spinach and sausage. I looked forward to it every holiday. Don’t know how I happened on your recipe but I was again searching in desperation. I live in Windsor, CT now. I’d definitely make the trip snd order ahead if you were ever to sell them!! So nice to hear from you, Peggy! It’s easier than you think—let me know how it comes out if you try it! Thanks for the recipe! I have tried the potato scacciata recipe you sent me. It needs some fine tuning on my end but it was pretty close to what I remember. I can’t wait to try this broccoli recipe! I have been in RI for many years now – it is so nice to see all the posts from Middletown! I also went to Macdonough School (’74) and then Central Middle school(’77) before attending Mercy, Class of ’81. I wish we could have a huge scacciata reunion. I can’t believe you went to Macdonough, too! We are our own unique little Middletown club. I love it!!! i grew up in Portland, right across the bridge from Middletown. I was just talking about Marino’s and scacciata. I loved the potato one! Their hamburg pizza was the best! Thanks for th memories! Never had better any where I’ve been. Living in Florida now. I still miss Marino’s! We grew up in so much better times, didn’t we? Thanks for stopping by!